One of the most frustrating situations a golfer faces is the loss of a favourite club. Whether left near a bunker or having fallen out of your bag, that club is likely to be a favorite you use regularly to help you play your best and enjoy your round. Often more frustrating is that the cost of trying to replace that favorite putter or hybrid for yourself or family member. This can be a budget breaker even if you can find a used one just like that lost club. Enter Caditag … the new revolutionary, technology based golf club tracking system, which assists in reuniting golf clubs with their rightful owners at a very affordable price. 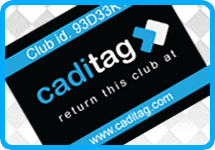 Caditag works by having a unique identification number label applied to each club, when a mislaid club is found and handed in to a Trusted Partner this number is used through our FOUND A CLUB system to send an instant SMS message and email informing the owner of the location of their club. The owner can then choose to collect the golf club OR request Caditag to send the club to them. All personal information is secure.